"Don't pull my leg, Arty, it might come off in your hands." You've got to give Neil Simon credit for wanting to challenge himself professionally. Decades of hits have made him probably the most successful comedy writer of all time, and no doubt he could easily enough churn out more of the same, and be amply compensated for doing so. But with Lost in Yonkers he moved beyond the wisecracking and very funny characters of his most renowned work, like The Odd Couple or The Sunshine Boys, and wrote about family, its problems and obstacles, and the two great forces that both keep families together and drive them apart: money and guilt. Simon was rewarded with a Pulitzer Prize for his efforts (though that year I was partial to Six Degrees of Separation, myself), and shortly thereafter his play was "opened up" for the screen. And the billing on the movie reminds us that Simon is one of the few writers who is a commodity in his own right—this isn't just Lost In Yonkers, it's Neil Simon's Lost in Yonkers. It's 1942, and Eddie (Jack Laufer) is a widower; only the Mob would lend him the money to care for his wife as she was dying, and now the Mafiosi want to be repaid. Eddie is going to seize a wartime opportunity, selling metal to munitions factories around the country—the only obstacles are his two boys, Jay and Arty (Brad Stoll and Mike Damus). Who will look after them when Dad is on the road? 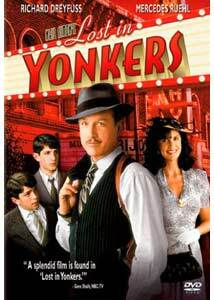 Eddie appeals to his mother (Irene Worth), the forbidding German immigrant known only as Grandma; she lives of course in Yonkers, just north of New York City, with her daughter, Bella (Mercedes Ruehl), who even at 36 cannot quite take care of herself. The arrival and departure of the two boys is a dramatic convenience, for the story's principal concern is Bella, and her desire to have an independent life. The movie is at its weakest early on, when we see Bella at her daffiest—it's Ruehl very over the top, sort of her bid to do her Rain Man. Bella's impairment doesn't seem to be well understood by the characters or even by the filmmakers, so Bella's struggles with her world seem more arbitrary than compassionate; Bella isn't condescended to, but still, we're not quite at the heart of this woman. She loves to go to the movies, and even meets that special someone there—David Straitharn plays Johnny, head usher at the Bijou, and Johnny and Bella talk about getting married and opening a restaurant together. In these scenes, Simon's professionalism and craft shine, but still, everyone talks like a Borscht Belt comedian, and you sense that the writer is finding his way as he goes. Grandma is a matriarchal titan, looking to toughen up her children: "You don't survive in this world without being like steel." She can be nasty and petty, and though the boys don't much take to her, about the worst she does to them is grab them by the ear, as she hollers to the world in general, "Stupid dummkopf!" The bulk of her wrath is saved for her children, especially for Bella when she dares to voice her dreams of independence. When mother and daughter go toe to toe late in the story, much of it is very moving—this is where Simon's risks pay off, where he's looking for more than just the laugh. Bella pleads with her mother: "I gotta love somebody who will love me back before I die," and her anguish and desire are palpable. But the storytelling lacks the steady hand that Simon demonstrates on his home turf of comedy, and the director, Martha Coolidge, doesn't contribute much either to transposing the stage play into a movie or to providing keener insights into these women. Richard Dreyfuss gets top billing, but his is a supporting role at best—it's close to an hour into the story until Uncle Louie shows up, a gangster on the lam. It's a show-stopping part and Dreyfuss is happy to chew it up—as one of his nephews says about Louie, "It's like having a James Cagney movie in your own house." There's also a lesson here in the vagaries of reputation in the entertainment business, and about star wattage. Ruehl and Worth are reprising roles they played in the original Broadway production, but the promising young actor who appeared with them on stage, despite winning acclaim and a Tony award for his performance as Uncle Louie, was jettisoned for a bigger movie star. That actor's name: Kevin Spacey. Image Transfer Review: The color palette and black levels are pretty strong and steady, and the only interference come from too many small scratches. Audio Transfer Review: Dialogue is clear, though there seems to have been an inordinate amount of looping; the ambient noise level ratchets up way too high with some regularity, and there's a bit of hiss, as well. Extras Review: Just the chapter stops and a couple of extra trailers, and a pretty arbitrary pair of them at that. Lost in Yonkers takes more risks than most Neil Simon stories, and while not all of them pay off, much of it is genuinely moving. This DVD release is worth a look, almost more for effort than for performance.